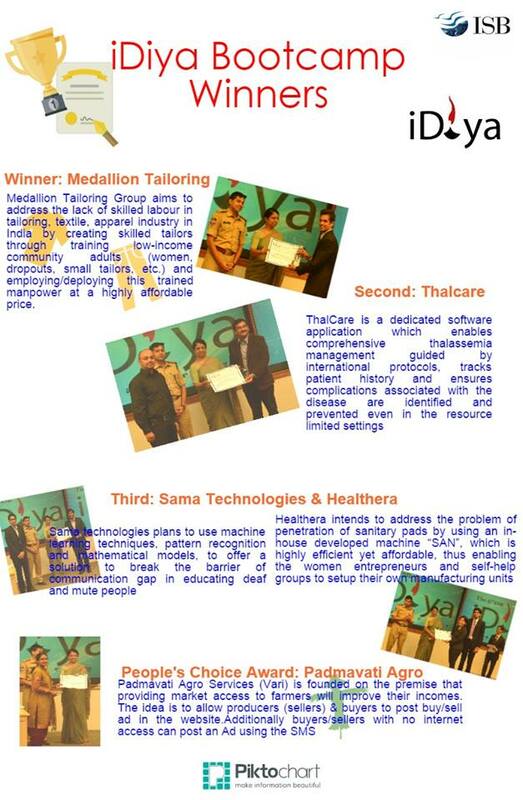 iDiya is Indian School of Business national Social Venture Ideas Competition. iDiya is targeted at working professionals in India working in teams of 2 to 4 individuals. Teams submit an executive summary of their business ideas and plans, which are evaluated by student evaluators, Faculty, investors and Social VCs and Social entrepreneurs. Submissions are evaluated on various parameters, including measurable social impact, criticality of the social need and sustainability of the enterprise. Winners are invited to ISB for an intensive one week boot camp, where industry experts, ISB faculty and local and national entrepreneurs help them train for challenges they would face in bringing their ideas and ventures to realization. Teams are interfaced with potential investors and are matched with entrepreneurs and organizations that will mentor them for a certain period post-boot camp.